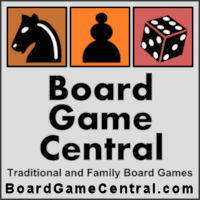 The latest news in the world of board games: Ticket to Ride Now on Android, Las Vegas Board Game Review, River Dragons Review, Council of Verona, and more board game news and reviews. The latest news in the world of board games: Facebook Scrabble Boycott, Monopoly Mistakes, Bora Bora, Wordner, Power Grid, Warhammer Quest, and more board game news and reviews. The latest news in the world of board games: Quarantine, Il Vecchio, Stones of Fate, Swords and Heroes, Call of Cthulhu, and more board game news and reviews. The latest news in the world of board games: Aztlan, Cursed, Mom's Friendly Game Shop, Pandemic: On the Brink, The Cave, Board game created by Nun, and more board game news and reviews. This year's Mind Games competition was held in Arlington, Texas, with more than 300 players reviewing the 54 game entries.